Pale pink and violet colours with white shading, mild in taste and smooth texture when cooked. 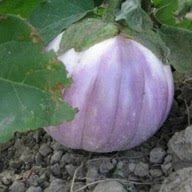 The unusual coloration makes this classic Italian heritage aubergine truly special. The subtle sweetness, the absence of bitterness and the creamy consistency brings it close to perfection. Expect less harvest if growing in cooler climates but it is still worth a try!